This little cutie is my great niece who was born a few weeks early. We said a lot of prayers for her and her mommy who had to spend several weeks in the hospital before baby was born. We are thankful that she did not have to spend any time in the NICU and was able to go home after just two days!! DK Yarn in the color of your choice, I used Cascade Cherub DK in Lavendar color 16. Hook size for the hat was H or 5mm. Yarn needle to weave in ends and sew on flower. 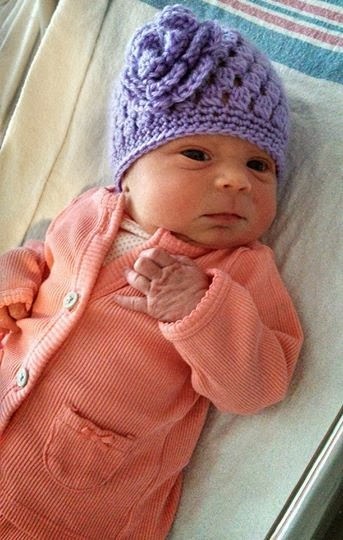 For a Preemie hat use a G hook. Flower: chain 4 and make a loop. I LOVE this pattern!! Thank you so much for sharing! I found the adult size...do you have a pattern for toddler and child size?? Thanks again! For a toddler hat switch to an I hook and add one more round of increases, so Round 7 would be 2 HDC in the first stitch, 1 HDC in the next 7 stitches. Round 8 would be the start of cluster stitches and you would work clusters to round 14. Rounds 15-18 would be the rim. I will have to do a practice one for child size to see what works best. I made this for my daughter and go so many compliments. She was the hit of the maternity ward. I am about to make it for another soon to join us baby. Let me know if you would like a picture. Allison, did you trytmaking it for a 2 year old? Attempting that now. Wondering if adding 2 more rounds of increase and an I hook will do the trick. Row 7: I know we start with a beginning cluster, But do the directions say to begin cluster around. Is that correct? Or do we skip a stitch and regular cluster the rest of the way around? I have the same question....it says beg cl both times. I'm wondering if it's just a cluster??? I am trying to do the flower for the Newborn Rose Beanie. I have the hat finished, with no problem, but I am getting frustrated with the flower. I am not understanding the directions. Is there a video showing how to do the flower? Thank you. Debbie I had the same problem as you, I couldn't understand the flower pattern. I believe I figured out the problem. In round 2 you need to repeat from the * 2 more times. This will give you the 3 petals you will need for the next round. The author has the * there but doesn't say to repeat. All I know is that when I repeat from the * and make a total of 3 petals in round 2, then I can follow the rest of the pattern. The hat is very easy to make and I have made many of them but my attempt to make the flower is a total failure. Can you either explain in a little more detail how to make the flower or as mentioned above is there a video? I have searched the internet for a video of similar flowers but can't find a video explaining how to make this lovely flower. Thank you. I am having the same issue. Finished the hat, and I am absolutely thrilled about how it turned out. The flower is confusing. Would love to see a video if possible.